Dauria Aerospace, a multinational aerospace company providing global data, communication and remote sensing information, and Elecnor Deimos, the technology-focused subsidiary of Elecnor, announced in May 2014 a joint partnership to develop Deimos Perseus, the first satellite constellation to provide frequent imaging of the entire Earth. These Perseus-O satellites will be built by Canopus Systems US, an US American independent affiliate of the Russian Dauria Aerospace, and carry high quality multispectral sensors that provide for automated identification of ground features such as crop types, their vigor, and stage in the growing cycle. 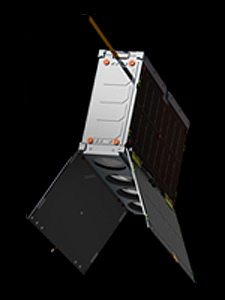 The Perseus-O satellites are built to the CubeSat (6U) standard and feature a multispectral imaging system with a resolution of 22 meters per pixel. Elecnor Deimos currently operates Deimos-1, an earth imaging satellite deployed in 2009, which provides wideband imagery with frequent revisits of each territory. Deimos-1 will be combined with Dauria Aerospace’s eight Perseus-O satellites and utilize a ground segment developed by Dauria and Elecnor Deimos for imagery receipt and data processing. The first four Perseus-O satellites were scheduled for deployment in early 2015, with the remaining four planned for the third quarter of that year. Dauria had already launched two Perseus-M maritime surveillance satellites developed by Canopus Systems US, an independent affiliate of Dauria Aerospace. The goal to establish the constellation by the end of 2016 was abandoned due to low funding, U.S. competition, sanctions against Russia and the collapse of the ruble. Also the US daughter company Canopus System was closed down. The Canopus core team founded a new company, Aquila Space, to develop the similar Landmapper-BC satellites. Dauria has apparently partnered with South Korean SatByul Co. LTD to build the Perseus-O satellites.